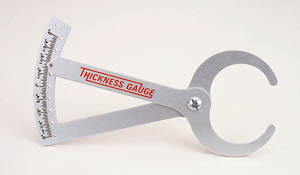 This inexpensive aluminum gauge offers the perfect way to check the thickness of lumber you may be buying, workpieces you may be planing or bowls or similar projects you may be turning on the lathe. Just slip the curved jaws over the item to be measured and read the thickness from 1/32-inch to 2-inches (0 to 55mm) on the dial. Go back to the Lathe Accessories Index!